Greetings, Joe’s readers. I had something come up today, so Joe and I are doing today’s regular blog post a little differently than usual. He wrote it earlier, it is a top ten list, and now I am editing it at my home. I have a question for Joe before I post it, so it will be later than we thought today. We will get it out to you as soon as possible. Thanks for reading his blog, and for waiting today for a new post. Take care and happy reading. Greetings, readers. With my sinus infection still holding on, Rebecca and I have emails to doctors to write, which may or may not take a lot of time. So, I have decided to hold off the top ten list until tomorrow. It’s going to be a busy week for me with upcoming appointments and possible impromptu doctors visits. Oh, the joys of being sick during the fall. Once all the college kids come back to Penn State in late August they bring all their germs with them. For once, I can pinpoint precisely how I got sick. Our local pharmacy has this screen to sign with a pen, and of course all the sick college kids use this pen to sign their name for their prescriptions. Even though there is a big jug of antibacterial hand sanitizer, no one seems to use it, including me. When I picked up my antibiotic a few days ago, I made damn sure to use the hand sanitizer, which I will do from now on. I’ve not decided on a topic for tomorrow’s top ten list but I will probably write the draft tonight so that tomorrow Rebecca and I can edit and put it up. After today’s work hours, Traci and I are going to get coffee somewhere and enjoy the afternoon. This evening I will turn on Netflix streaming and watch the new Hawaii Five-O series. The show has been on since 2010, but I never really got into it until now. I’ve decided to watch every episode (all six seasons) and give it a fair shake instead of comparing it to the original series. Well, there is my day in a nutshell. Until tomorrow, take care, have a wonderful day, and happy reading. Greetings, readers. I will dictate this blog entry while my voice holds out. I’m still getting over whatever this cold/infection thing is. Although my sinuses are clearer today, my throat is scratchy and half an octave lower. Oh dear, oh dear. We are writers, so we carry on and write. The big news of the day is that my new recliner arrived. Well, new for me. I got it at a used furniture store and it is in extremely good condition. To my surprise and joy, Keekee also seems to like it. It is very soft cloth material, blue in color, and is wider and longer than my other chair. It was a very good purchase, especially since I got it on sale. When the old chair was removed, I quickly had to run the vacuum and get all the little bits and pieces of the last eight years of snacking and tissues out from the space. It was a chore, especially at 8:15 in the morning, but I got it done. The delivery men placed the chair down and plugged it in, and didn’t really wait for a tip. I wasn’t sure if I was supposed to do that or not. Perhaps it is factored in to the delivery charge. Even with that extra charge, I still think I got a great bargain. On a side note, it is a foggy morning here in State College, PA. It was quite cool last night, when I had to step outside at 3:30 in the morning to get fresh air for my ailing sinuses. As with most people, I don’t sleep well when I am sick; I keep waking up and that is extremely annoying. Both Penn State University and State College Area High School have their homecoming games this week, which means two parades and plenty of people here for the weekend. I thought my cousin Eddie and his family might come in from New York, but I just spoke to him and he is going to choose another weekend. Eddie graduated from Penn State and loved every minute of it. He always attends at least one game a year. Lastly, on the bus the other evening, there was a report of two people dressed in sinister clown outfits wielding weapons. The bus drivers, via telephone, were kept up to date on the whereabouts of these two clowns. They were hoping they would not board one of the buses. I asked my bus driver what the protocol was in case something like that happens. She said that if they weren’t carrying weapons in their hands, then they could get on the bus. They couldn’t if they were brandishing weapons. When I got off at my stop, there was no update, so I never did find out exactly what happened. I assume that all these clown sightings across this area and across the country are due to next year’s release of the remake of the movie It, which was based on Stephen King’s original novel. I think these people are sick to willingly want to scare people. Sure, on Halloween kids and teenagers dress up in costumes. Folks around the country expect it then; not now. All I know is, if I see one, I’m going to duck into the nearest establishment. Well with my voice almost totally gone, I will end this blog entry here, and tell you that next Wednesday I will have a top ten list for you. Take care, have a good weekend, and happy reading. UPDATE: 10/19/16 I have a photo of the new chair now to share with you. 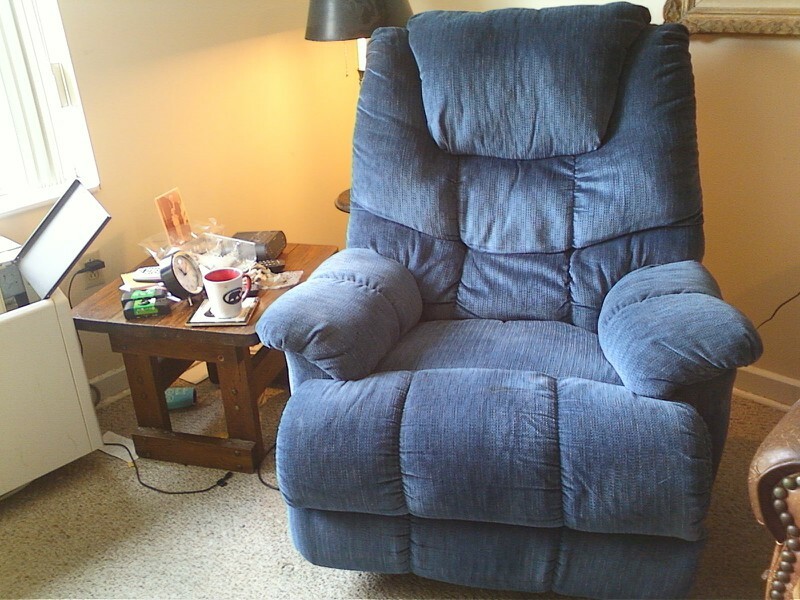 My new [used] recliner. Arrived at my place on October 6, 2016.